So glad you guys are getting into it, its encouraging. Next month my target is to set up my bay, paint with blue, make stands and a rocker stick. That will probably take a few weeks. Ive sort of been mucking around with Aku and come up with an idea which im going to bounce off with a mate to try to get the rocker as I want. I wont get the blank cut, rather I will do it myself. I love taking my time and whittling bits away each day, a bit of foam in the air and a cold beer once done. It will be a great way to keep my self entertained till I can get back in the water. IM chasing a twin, fins four inches from the back. The contours are based on what I saw on a sand dune with a strong wind ripping up the sides, it had me mesmerized for four years, so im going for it. Its sort of like a bonzer bottom but its not, Single within a single hour glass to double but it will edge out further up the tail to in effect a sorta flex in the tail, cant explain it any other way. The stringer will end up being higher than the sides and im thinking it will be a rolled double so it will sorta hopefully act as a stabliser in a way. I dont really care if it works or not. Im just interested in copying what I say in nature and how the sand was blown up this sandhill and burst over the top, its a picture I cant get rid off. Ive dreamt about it for years now. I might make it a twinser but I think it will suit a twin, glassed on fins, after I shape it will send pics to a mate and decide on fins, ive got two thoughts on that. If the board looks alright I will have a friend glass it for me as it will be beyond my abilities, no harm in admitting that. I also want to use the same dims and make a twinny with clinkers, just for fun. 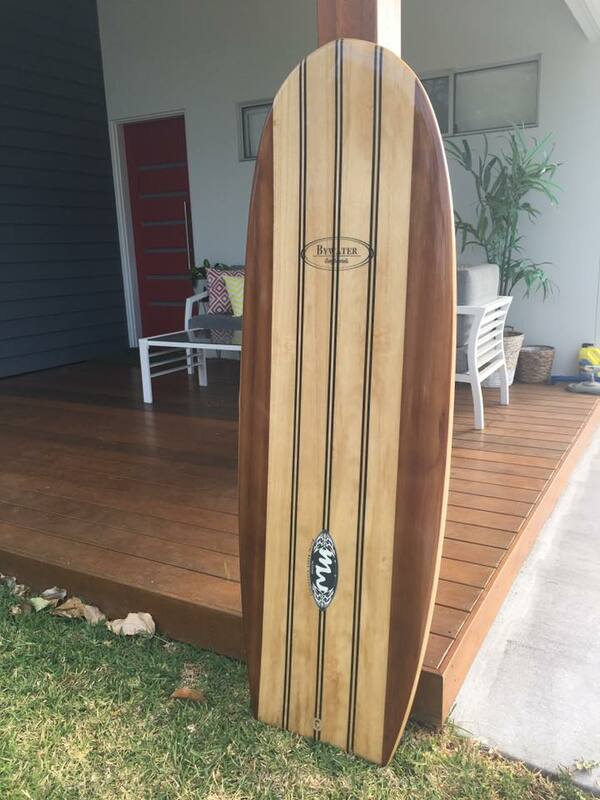 Will paint her in the Eastwood (woodies colors in honor of my old man, might give it to a friend if I can never surf again, if it goes well that is, if its a dog but just made for good fun then it will go straight to the pool room and up on the wall. Has anyone got any favorite vids on shaping rails, as these always freak me out, more than any other part of the board, i find the rails the most difficult. Any discussion on rails is appreciated if you guys want to. I will doco everything on here, the building of the under the house bay, the rocker stick, and then the shaping from blank till end. Looking forward to seeing how you go digs . All the best to you. Don't they have a demo mode for free ? Do you get foil measurments with this. Im going to go with a three and a bit inch blank around 6'6 if I can find one. skin her flat to the rocker im looking for then start work on the concaves, aim to leave 2 3/4 after concaves cut in. Might even look at deck concaves under back foot, all depends if I can find a blank thick enough to allow me to find my rocker and then cut in the stuff through the engine room im looking for. $8 bucks aint to bad a deal if I can save the file. Get foil measurments to look at whilst working plus print off a template from Cad or something like that. Cancel the bugger after that. They dont have a mode for free but I would like to start a discussion with them for those who dont need the machine stuff for cutting, rather just pay for templates printed off. Dont think I will get far though. $8, might look into that. Sorry saltman, im pc inept. I thought you needed to save the file to print it off. How do you print it off to a pdf. The reason I would like the foil measurments is I can get a nice deckline in by following the thickness measurments of the foil. Sorta let the bottom decide the top deckline if you know what I mean. Sorry printing off a template to pdf and the foil to pdf would be really cool if I could work that out then bingo..... Ive got one file saved though I never really got it totally to my liking yet. I roughed out a new shape last week and tinkered with it a bit on the weekend, just need to finish the bottom contours and roll the rails. The outline is based on a tomo evo with a different take on the tail (still have to cut in an angled swallow). if you are after free templates, the blending curves website is back up. go take a look, Andrew has been building downloadable PDF templates for 5 years so there is heaps on there. I've decided to go an old way. I'm working out basic measurements like the 12 inch ones and width and where widest point is on Aku. Then I'm just going to use a few nails, a baton, thin mdf and a baton. Simply bend and draw. Tools organised and stands finally made. I used memory foam and doubled it up for padding instead of the carpet. Decided to keep it simple as fancy shaping stands wont make me a better shaper so why not keep to basics. The only thing left to do is side lights and black plastic on the walls to get the shading im after. Im picking up a blank that I started shaping four years ago on thursday. A good mate of mine wrapped her up in bubble wrap and put it aside for me to finish. I just need to shape the rails, tidy up, cut in the tail and hey presto. Will wait for side lights before the final fisnish sand on blank. Ahh, my back is better, though I did not tip in the concrete or lift any heavy bits mate. I had a mate help do all the heavy work. He drilled the holes, I did the measuring, cutting, glueing. He did the bolting, poring of concrete, grinding, and stapling of the memory foam as im just not strong enough for that stuff. Though I am well enough to shape and I finally get to start on friday under the house. Will take plenty of pics. Might start a thread on it. Though its a bit hard to get all the bits as I started this four or five years ago on a late night with Yorkys in his bay, a few beers, lots of laughs, and plenty of storys swapped. Cant really remember much of that night though do remember the friendship. Miss the cheeky bugger. If i can remember right we mowed to much foam out of the tail whilst under the influence of a few beers and then we tried to add it back on, bahahahahah, ahhh. Will complete the board for my lad. They are bloody heavy as well Beerfan, but they roll well. yep i'm still shaping. not doing many customer boards these days due to time and got sick of making boards i didn't like. Just keeping myself and friends happy! unwrapped the blank and started sanding her smooth, trouble was without side lighting I could not see the shadows, the bumps. Shaping has now been delayed until I get proper lighting underneath. The other pic is just of the stuff I use for shaping, theres a touch more like the shapers layout square and a recently required tiny spoke shave. Have a nice day all. Some of you might remember Mick. Ledge71 on here. He keeps popping out boards when he feels like it. His latest project produced this gem.